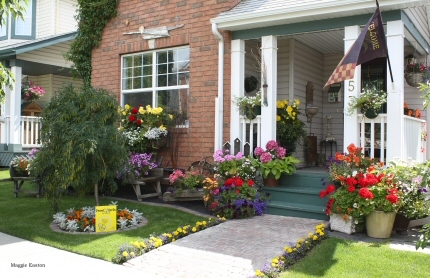 In 2017, Front Yards in Bloom received 6,148 nominations. If a yard does not meet the 25% flower cover or non-turf plants requirement, volunteers are required to let the program assistant know and the address will be removed from the nominated list. Yards must have access, no locked gates or high fences that block public view. Volunteers are encouraged to let the program assisant know the addresses they do not deliver a sign to. Attendance to a training session led by the Edmonton Horticultural Society is highly recommended for first-time volunteers. An invitation to this training session is included in the volunteer package sent out. Signs and brochures are delivered in two phases: Early Bird round (June 15-30) and final round (July 1-15). Early bird rounds typically account for 10% of the total yards nominated. The edible, natural and public spaces category are managed by a subset of volunteers from distinct groups, and the top 3 yards are determined for each by these groups.